October 12, 2012 By arzea Leave a Comment This post may contain affiliate links. Read my disclosure policy. 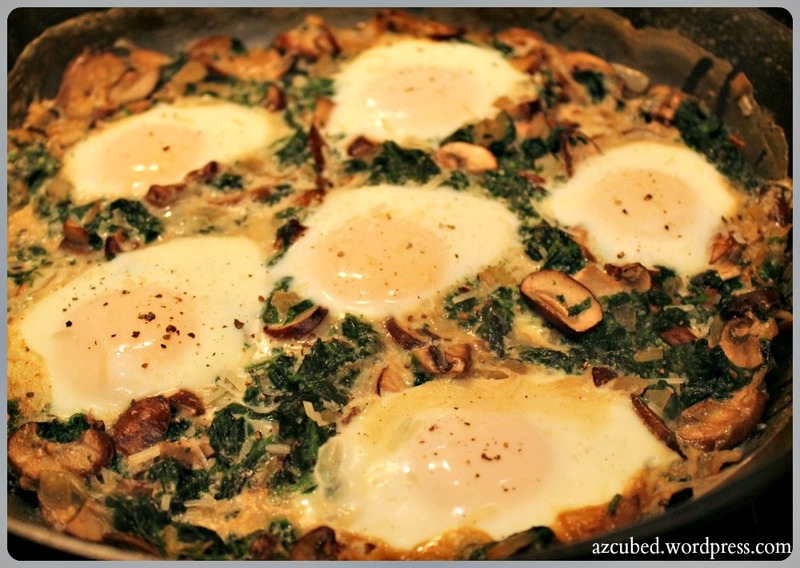 Oh look, another baked eggs recipe!! 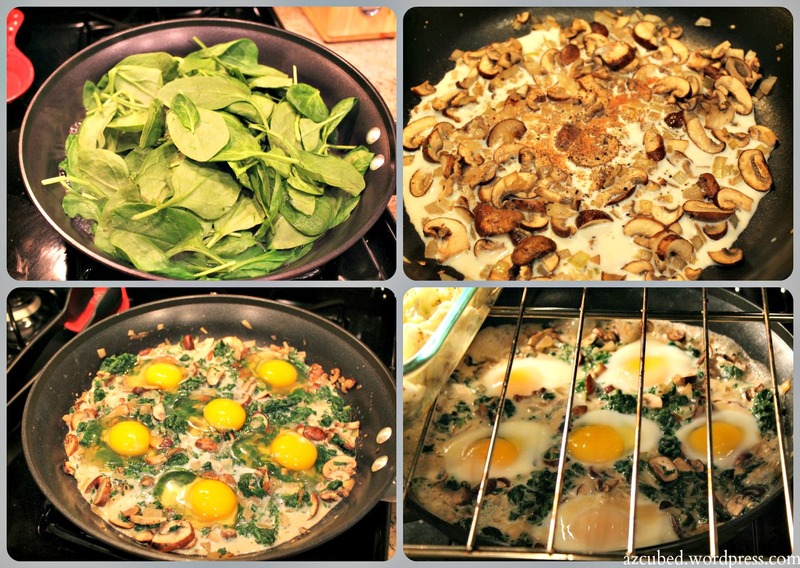 I love eggs, so finding ways to incorporate them into a healthy hearty dinner is always exciting for me. This recipe was simple, quick, and on the cheap side…total win! The dash of nutmeg in this dish gives it a little flavor that you aren’t expecting, and it’s perfect for fall. 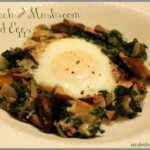 I wouldn’t hesitate to serve this for breakfast, brunch, lunch, or dinner! This time, I made it for dinner and served it with a side of roasted lemon cauliflower…yum! 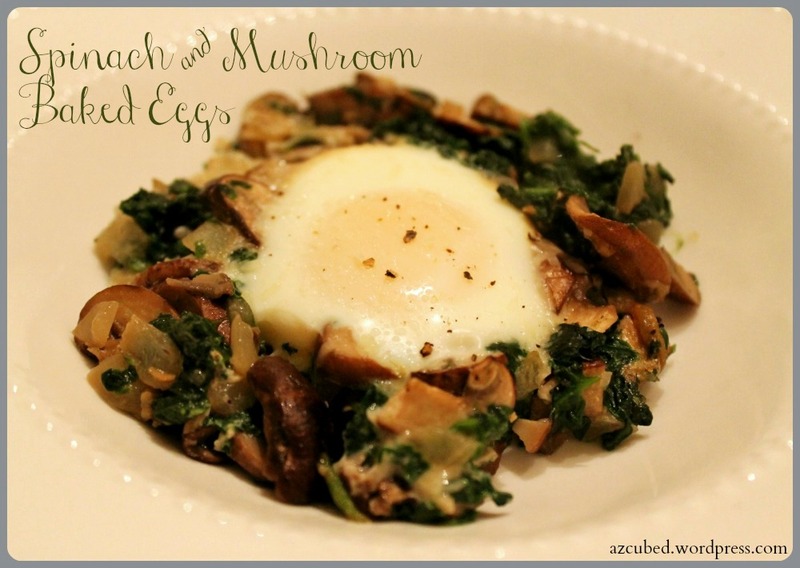 This recipe is also very low calorie for a dinner/meal. I calculated 3 servings (2 eggs each) and they came in at 300 calories per serving! 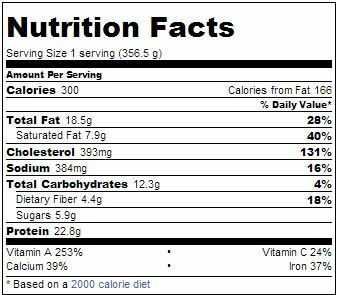 See below for the nutritional information. Wipe skillet dry, then cook onion and garlic in butter over moderately low heat, stirring, until softened, 2 to 3 minutes. Add mushrooms and increase heat to moderate, then cook, stirring, until mushrooms are softened and have exuded liquid, about 3 minutes. Stir in cream, salt, pepper, nutmeg, and chopped spinach and bring to a simmer** (see note). Remove skillet from heat and make 4 large indentations in spinach mixture. Break an egg into each indentation and bake, uncovered, until egg whites are set but yolks are still runny, 7 to 10 minutes. Lightly season eggs with salt and pepper, then sprinkle with cheese. **I ended up adding about 1/3 cup of additional skim milk because the mixture did not have enough liquid in my opinion. I would suggest adding this, before you egg the eggs, and mix for 30 seconds, then add eggs.